A very big birthday – one ending in zero – befell Beloved Spouse this week. We considered declaring it to be fake news and paying it no attention, but in the end we decided to celebrate it. In our house (as should be common knowledge by now), celebration requires dining on excellent food and wine, so that’s what we did – with a menu chosen by Himself. We made a bold start with caviar and champagne. In addition to the relatively inexpensive American “osetra” that we’ve bought online in the past, the birthday boy snuck in a tiny jar of Russian osetra, for comparison. Alas: It was noticeably better than the domestic one, making it a costly taste to try to avoid acquiring. The champagne was Krug, a gift from a very good friend. 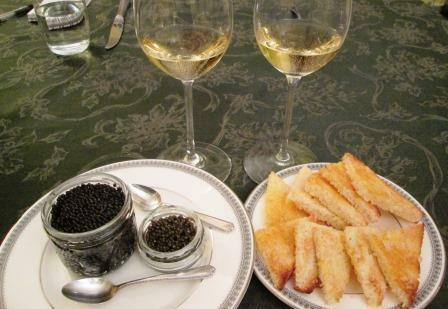 And very Krug it was, a big, vigorous, richly flavored companion to the caviar. This luscious start, Himself averred, already began to ease the sting of the birthday’s bigness. 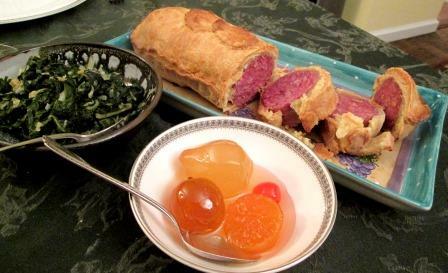 For the main course, he had requested saucisson en croûte, a large sausage baked in a pastry crust. I’d never made one before, but with a little help from Julia Child, in Mastering, I set to work. Early in the day I simmered a one-pound cotechino sausage in water until fully cooked and made up a batch of pâte brisée. 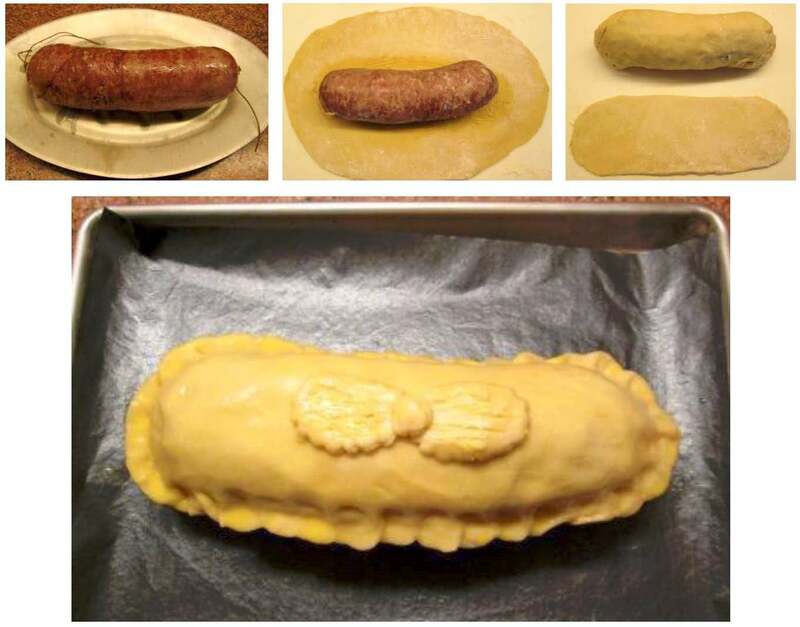 Later I rolled out an oblong of the pastry dough, brushed the center with mustard, and set the cooled and skinned sausage on it. I encased the sausage in the dough and rolled out another strip to lay over the top, decorated it modestly and brushed it with egg glaze. The stuffed pastry baked in a hot oven for 45 minutes. For a vegetable, the birthday celebrant joined me in the kitchen and washed, parboiled, drained, and sauteed a bunch of fresh Swiss chard in butter with chopped onion. As a condiment we served mostarda di Cremona, fruits poached in mustard syrup, which we bring back from our trips to Italy. The combination was excellent. Though the pastry crust tried to fall apart at the slicing, it was very tasty, seeming to have imbibed some meaty essence from the juicy, spicy sausage. In keeping with the developing binational theme of the meal (American and Russian caviar, Italian sausage in French pastry, Italian fruits and Swiss chard) Tom selected two bottles from his wine closet to drink with the main course, one each from Italy and France, both vintage 2004: a Barolo riserva from Giacomo Borgogno and a Nuits-St.-Georges from Drouhin. He was curious to see which one would go better with the food. Here he is with the result. The two wines behaved remarkably similarly with all the elements of the dinner, both feeling soft, even velvety, on the palate, and tasting of earth-and-mineral-inflected dark fruit. Neither wine was anywhere near its peak, but both showed well, enjoyably drinkable and fresh, while hinting of the greater complexity they’d be capable of in the future. The Barolo evidenced a bit more tannin, the Burgundy a bit more acid – but either wine would have served comfortably as the consort of the dishes. 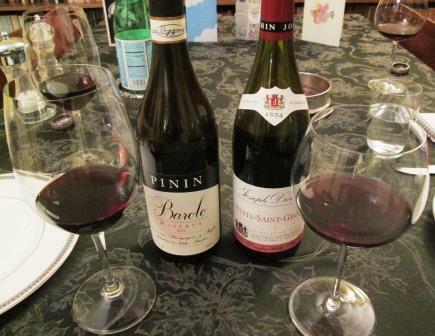 Another illustration of why so often Barolo and Burgundy are compared! To conclude this festive meal we indulged in a pair of purchased chocolate delicacies: a square of opera cake and a chocolate mousse tartlet. And so ended another decade of the culinary and enological adventures of Himself and his adoring spouse. We mustn’t wait too long to have Russian osetra again and another bottle of Krug. After all, who knows how many more decades we have in us? Happy happy belated birthday wishes ! Your beloved spouse is most certainly beloved by you and your loving gastronomic ministrations. I agree whole heartedly with your philosophy. Eat, drink and be merry ! I love your posts. That looks like a delicious meal! I believe I will give the “sausage ” recipe a try. Happy Birthday to your beloved spouse and may both of you celebrate many many more together. What a nice celebration. Happy Birthday! Happy Birthday Tom- What a dinner!!! Happiest of belated birthday wishes to Tom! Bravo on making it to the next birthday, no matter what number it ends with. Superb. Thanks for sharing electronically, if not physically. Wishing you many more decades, and similar meals. Remember: you EACH have birthdays, so that’s two every 10 years, at a minimum. And my thanks to you all as well, for your kind words about the post.